It hasn’t received all that much coverage, but the Netherlands passed a bill on Tuesday barring all contact with Hamas. The issue here is not whether or not engagement with Hamas is the proper course. The politics behind this bill, however, are most interesting. The bill was introduced in the Dutch parliament by the Party for Freedom and Democracy, a far right party whose leader, Geert Wilders, has embraced controversy with his explicit hatred of Islam. 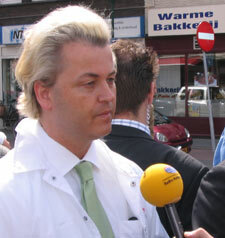 Wilders’ party is gaining popularity in the Netherlands. According to this report in Ha’aretz, the party currently holds nine seats in parliament, but would win 32 seats if elections were held now. Wilders has been charged in an Amsterdam court with incitement to hatred and in February was banned from entering the United Kingdom due to his hate-filled speeches regarding Islam. Wilders and his party make support for Israel a major part of their platform. Many welcome this. But is this really the wagon Israel and the Jewish people want to hitch to? Here in the US, support for Israel has become synonymous with neo-conservatism, and the American right wing, despite the fact that the overwhelming majority of Jews holds liberal views and does not support the neocon idea of what “pro-Israel” means. More to the point, American adoption of such policies has led to the most hopeless period in the Israel-Arab conflict, the one we are in now. They have, unintentionally one presumes, helped build a great deal of support for Hamas and also even more radical Islamist groups while seriously weakening more moderate Palestinian leaders. Of course this is by no means entirely due to the rightward shift in the US from 2001 through 2008, but it was a major factor. And the ongoing linkage of Israel with right-wing policies (a perception aided greatly by Avigdor Lieberman, of course) increases the alienation of Israel from the mainstream, both for much of the West and for the majority of world Jewry as well. The friendship of Wilders’ party is something Jews and certainly the Israeli leadership should be saying “thanks, but no thanks” to in as loud a voice as possible. This entry was posted on April 24, 2009 at 5:42 pm and is filed under Uncategorized. You can follow any responses to this entry through the RSS 2.0 feed. You can leave a response, or trackback from your own site.